There’s no better feeling than the end of a race. Runners of all distances tend to ride that finish-line high as long as they can. But eventually, there comes the time to get back to training. It’s never easy, but it’s the only way to get back to the finish line and get a taste of that high again. Having said that, it’s much harder to get back into training if you did nothing to recover the day after your race. 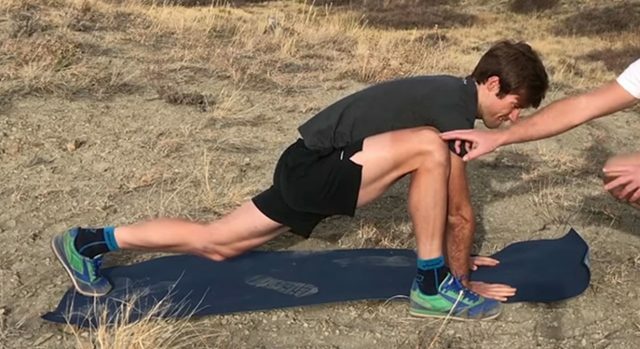 Set yourself up for success in future training and races by performing this simple post-race recovery routine the day after your race. This will get the blood flowing and reintroduce motion in your joints. Start simply. Just take a 20-30-minute walk to get the blood flowing and remind your joints what a little bit of impact feels like. Once you’ve done that, move into the routine: Move through each of the next four exercises in a cycle, repeating the entire recovery routine for about 15 minutes. 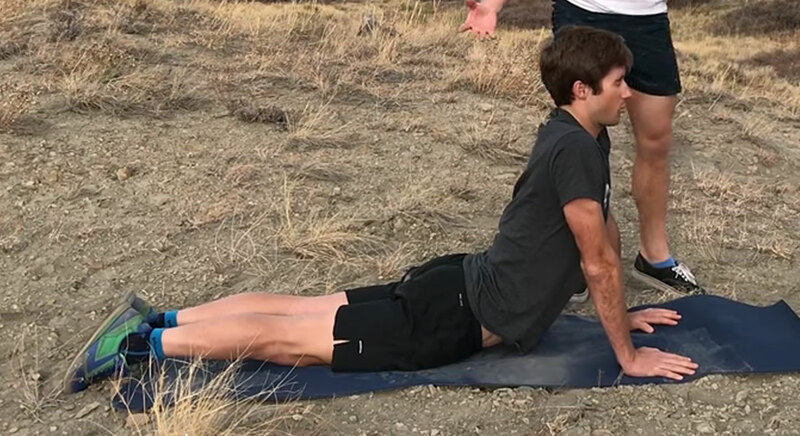 The first of the four movements is going to be a mountain climber stretch. To start, find a plank position on your hands. From there, take one foot and step it up outside your hands. Then make small, easy circles with your front knee. The position puts your hip in extreme flexion, and the circles break down lactic acid build-ups and bring back your muscles’ elasticity. After a couple of circles with one leg, bring that leg back to your plank, and repeat with the other leg. Go through this movement 10 times total, five times on each side. While a push-up is normally an exercise we’d find in a strength workout, it’s actually a great recovery tool as well. Push-ups restore a great amount of mobility in our shoulders and thoracic spine. Form is crucial to make sure you’re getting the most out of a push-up. Start in a plank position, pushing away from the ground as much as possible. Be sure your lower back is not arched at all. From there, pull your chest and hips down to the ground together. As you push yourself back up to the starting position, try to maintain that straight-body position you started with the entire time. 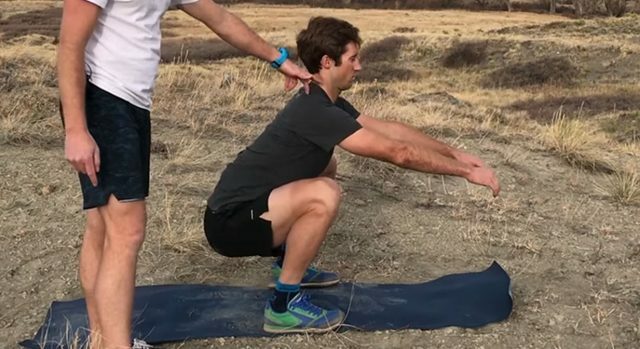 Letting your back arch and/or your shoulders pinch at any point on the way up will strain the exact areas we are trying to restore with this exercise. To modify, simply drop to your knees. Your form stays exactly the same in this modification! After 10 repetitions, move on to the next exercise. Next up is a simple air squat that helps you restore the range of motion in your hips, knees, ankles, and lower back. To start, place your feet right outside of your hips, with your toes pointed forward. From there, start to pull your hips backwards. This initiates the squat. Next, think about pulling your hips in between your heels as you lower down into your squat. Press your knees outward and keep your chest up as you lower down. Avoid rounding your back in this movement, and make sure your knees are not falling inward. To modify this, find something to sit on at the bottom of your squat. Just like with the push-up modification, all form stays the same in this version. Repeat this for 10 reps, and then move on in your cycle. Finally, you can finish out the routine (which you’re moving through for 15 minutes) with a cobra and a downward dog. Cobra is going to work open your lower back and improve spinal extension. 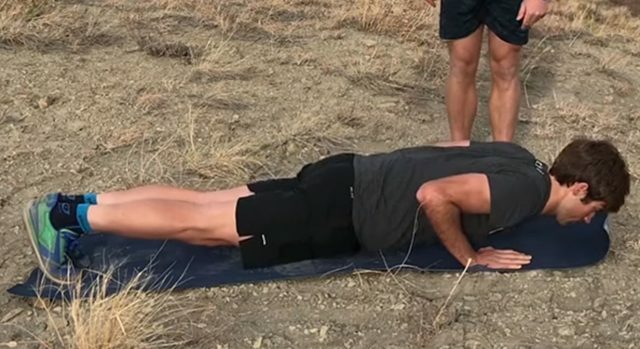 To begin, lay down on your stomach with your hands on the ground near your shoulders, as if you’re at the bottom of a push-up. Next, squeeze your glutes and push your hands into the ground, lifting your chest up off the ground. Never stop squeezing your glutes in the cobra movement. Try to keep your shoulders down away from your ears, only going up as far as your shoulders can stay down. Next, tuck your toes under and press into a downward dog position, with your hips pressed up towards the sky. Once in that downward dog shape, press down through your hands to press your body away from the ground. From there, move back into a plank and lower down to start your next rep, beginning with cobra. Complete 10 reps before starting this routine over. Do each of these exercises 10 times before moving onto the next one, moving through the entire routine for 15 minutes. Remember – this is a recovery routine! There is no time pressure. Take all of these movements slowly, and be sure you are getting the most out of them. Focusing on proper form and range of motion will have a big impact on your body’s recovery.